Growing and maintaining a goatee requires plenty of patience and practice. However, learning how to trim a goatee with a razor will save you time and money. On top of that, it is well worth the effort. Follow these simple steps to achieve such a timeless look. Before getting started learning how to trim a goatee with a razor, you should first shampoo and condition your facial hair thoroughly. Make sure to use products that are designed for your hair’s specific needs and texture. When you are finished, allow your beard to air dry fully. Alternatively, you may use a blow dryer on a low heat setting. However, be sure to keep it at least 12 inches away from your face to prevent irritating the skin. Otherwise, this can result in dryness and redness. Choose a well-lit room with a large mirror. You may also need a magnifying mirror such as a handheld unit for fine detailing. A high-quality straight razor is the most popular choice for trimming goatees. Nonetheless, you can use whatever kind you prefer. A wide-toothed comb is essential in addition to barber scissors for trimming strays away. Moisturizing shaving cream and a few towels are also critical. You will also need beard balm or oil to set your finished look and keep it looking its best. If you are just learning how to trim your goatee with a razor, a barber pencil will also come in handy until you learn how to shape your beard without a visual aid. Once you are ready to get started, comb through your beard thoroughly to remove tangles and prep it for trimming. Be sure to comb in your hair’s natural direction of growth to prevent mistakes later on. Next, use a beard pencil to outline the shape of your goatee. Take the width of your mustache and smile lines into consideration when creating your outline. Apply shaving lather generously to the areas that you want to remove. 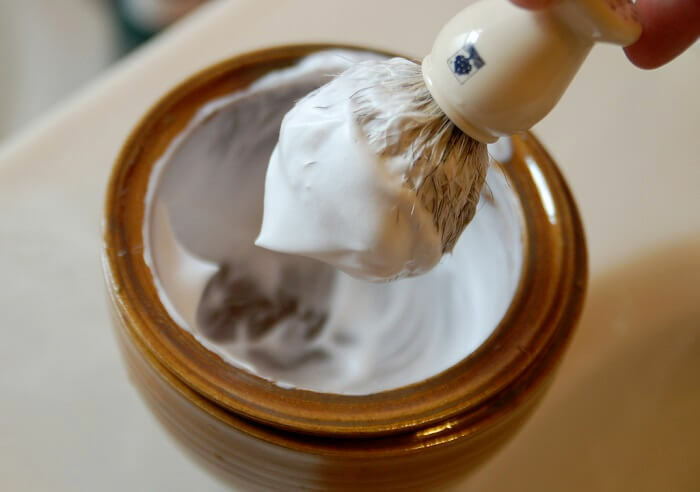 Take your time doing this to soften your whiskers and prepare your skin for the razor. If you have sensitive skin, you can open your pores by applying warm towel over your face prior to lathering. This, in turn, will make it easier to remove hair and lessen the risk of irritation caused by shaving. Once you are satisfied with your lather, use a towel to clean up the edges of your outline if needed before moving on to the next step. When using a razor, it is best to shave with the grain. This technique will significantly reduce irritation and the risk of painful nicks in your skin. Start shaving off undesired hair following your outline as a guide. Take your time and be patient, especially if you are new to learning how to trim a goatee with a razor. Doing so will prevent serious mistakes such as uneven edges and damaging your facial skin. Start by removing unwanted hair above your smile lines around the cheeks. Once you are done doing this, move on to shaping your mustache. Many men opt for rounded edges for a natural looking transition. 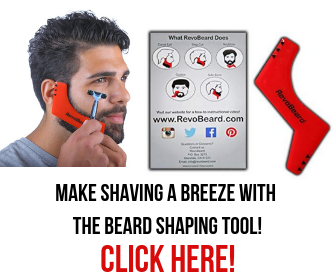 This is ideal if you are new to the goatee look or just learning how to use a razor. If you prefer a more angular looking goatee, do not round the edges. Instead, opt for a clean line. Remove the portions of hair below your bottom lip while maintaining a clean line in the middle leading to your chin. Lastly, use your Adam’s apple as a guide for cleaning up your neckline. Remove all the hair below it and don’t forget to do the outermost sides of your neck as well. When you are satisfied with the shape of your goatee, rinse your face thoroughly. Also, allow your goatee to air dry before touching up your final look. As hard as you try to ensure clean edges with a razor, you may notice a few stray or scraggly hairs when you are done shaving. No worries– simply use barber scissors to remove these unwanted hairs. Before getting started, make sure you comb your goatee thoroughly. You may need to repeat combing while touching up your hair to expose any hard to find stray hairs. Cut the hair at a slight angle to ensure that it blends properly with the rest of your goatee. The final step in learning how to trim a goatee with a razor is aftercare. When you are done trimming, you should moisturize your facial skin. Use an appropriate product for your skin type to prevent irritation. Beard balm or oil can also come in handy. These products can keep your look in place, add shine, and improve the texture and fullness of your goatee. Some can eve enhance growth when used regularly. They are critical for men with curly or very dense facial hair. Plan on touching up your goatee once every few days to keep it looking at its best. Waiting too long between trims can result in a sloppy looking goatee and make it more difficult to maintain some clean and well-blended lines. If you have ever felt intimidated learning how to trim a goatee with a razor, you can rest assured knowing that it gets easier with practice. Using a razor can also be challenging at first. However, this is the only way to ensure quality edges and a clean, classic look. Once you get the hang of it, you’ll be pleasantly surprised to see how quickly you can create a barbershop quality goatee at-home. Master trimming your goatee by trying these steps today! How Long Does It Take to Grow a Beard and Why Should You Have One?